One vehicle gets stolen every hour in Western Australia. Yes, you read that right. One every hour. The National Motor Vehicle Theft Reduction Council has conducted numerous studies over the years covering the trends and statistics in vehicle thefts. The year 2014 was considered a significant increase in vehicle thefts throughout Australia. And clearly, this hasn’t eased up. 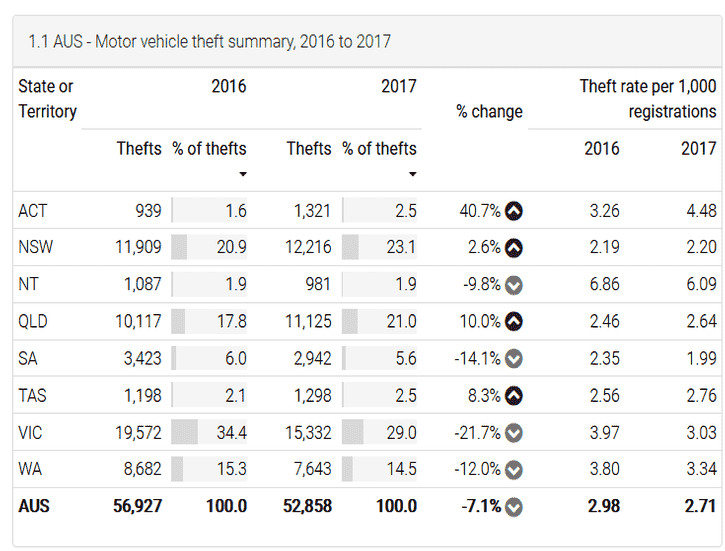 For the period October 2016-September 2017, the rate for stolen vehicles was “3.48 thefts per 1000 registered vehicles” in Western Australia alone. This was for cars, motorcycles, or trucks. It is the third highest rate in the country per 1000 registered vehicles. And yes, according to the data provided by the NMVTRC, this statistic only relates to registered vehicles. In total, over 54,000 vehicles were stolen across Australia, with nearly 8,000 of those being in Western Australia. Now, imagine that you are planning to buy a used car. What are the odds that you may end up purchasing a stolen vehicle? How will you know if it’s stolen? The scary part is that stolen vehicle recovery rates have fallen, so fewer stolen vehicles are being recovered. But, the one you buy may just be one that is recovered, and you are out of pocket for all that money. Car theft falls into two main categories – crime of opportunity and organized crime. Organized crime tends to focus on stealing vehicles to repurpose their parts. This makes it more difficult for the vehicle to be recovered since they are selling the parts at different points and to different buyers. Then there is the crime of opportunity. These sometimes are joyriders, which can lead to crashes. But mostly it’s a thief just seeing an unattended vehicle that can be easily stolen. Or, getting access to keys easily. Because more modern vehicles come with immobilisers, it makes a little bit more difficult to steal the cars. So, car thieves are now breaking into homes to take the keys and steal the cars. And of course, there are also the instances where persons are forced from their vehicles under threat. But stolen vehicles aren’t only being stripped for parts. The vehicle itself is being re-entered in the used car sales market and sold to unsuspecting buyers. And this is a major problem. Especially since most of the vehicles being stolen are now being stolen with the original keys still intact. As a vehicle owner, the recommendations are to properly secure your keys and your vehicles. Make sure when you go out, your bags are safely secured, because thefts are made out of gym bags for example. And when you are at home, you should not place the keys near windows and doors. And improve your overall home security. But what about unsuspecting buyers looking to buy a second-hand car? What precautions can they take to eliminate the possibility of buying a stolen car? Did you know that under the Sales of Goods Act 1895, if a seller does not have the lawful authority to sell a car, the title will remain with the original owner? And this is despite how many times the vehicle has been sold. So, yes, if you bought a stolen vehicle, you would have to relinquish possession without any recourse for compensation despite having paid for it. And that’s why the vehicle history is so important. There are many things to consider when buying a used car. What it looks like, the fuel economy, safety. And here are some used car buying tips to help you through the process of buying a car. But one thing you need to pay attention to is the vehicle history report. What if the vehicle is unregistered? Then you should ensure that the vehicle was never logged on the Written Off Vehicle Register, and most importantly, that it wasn’t listed as stolen. The best way to check that the vehicle wasn’t reported as stolen is by doing a Register of Encumbered Vehicles (REVS) Check. For a more detailed outline on the information you get with a REVS report, take a look at our post on all you need to know about REVS check. You can also get more information about doing a REVS check in WA. What is a Stolen Vehicle Check, WA? Vehicle theft should be a high priority for used car buyers. A stolen vehicle check is the same as getting a REVS Check wa gov report and is highly recommended by the Western Australia Police Force. This service is now managed by the Personal Property Securities Register (PPSR). NEVDIS enables cross-border collaboration on transport matters including vehicle theft. And helping consumers, whether personal or business, with their purchases. Together, these services help customers to get a car history check. And with a cheapest REVS Check service in Western Australia, you can get a comprehensive easy-to-read report with all these details easily laid out for you. Doing a best REVS check (also known as a VIN lookup and a PPSR Check) is one of the easiest ways to minimise the risk that you might buy a stolen vehicle. So, by now you understand the importance of getting a REVS check wa free and the information it provides. Let’s talk about the process to get a REVS report that can give you the peace of mind you seek when buying a used car. The car history report is crucial, especially if you’re buying from a private individual. You should always get an independent report from a reputable source. Free REVS check is a thing of the past. But you can get a detailed report cheap. If you want to enter your car buying process with the up-to-date, comprehensive information on the car’s history, then request a Quick REVS vehicle history report. The process is fast, and the most affordable on the market. So, don’t become a victim. Take the necessary precautions so that you don’t lose out by buying a stolen car. Get a free REVS check wa report and make sure that your new second-hand car is safe to buy, not just for your pocket, but also for your peace of mind.